At some point, I don’t recall exactly when, David shared what he was doing with the plants that were being identified. Two of his eighty or so flower mandalas are today’s Botany Photo(s) of the Day, Dying Pansy III and White Lily I-a. In late 2004, David approached me with a request to support his artwork by creating a distinct area on the forums for him to display his botanical art. Critical to his art is commentary by people with their thoughts or feelings of what his art invokes, so he needed a way to receive and display public feedback. In December 2004, we set up the Flower Mandalas Project forum as one way of doing this. David also set up a weblog in April 2005 as another way for people to comment: Phototransformations. For the past two years, I’ve been taking pictures of flowers and manipulating the images to form mandalas. I’d like to begin to assemble these images into a book, and I’d like your help. 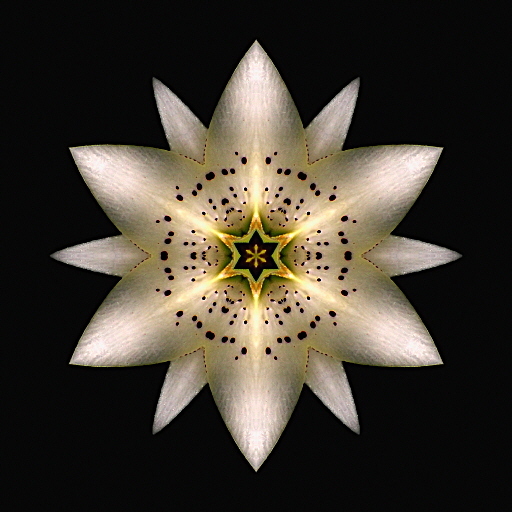 Suggestions for a word that these mandala images evoke, a complementary quote, or some history or other information about the flower itself are most welcome. When I began this project, I knew virtually nothing about flowers. Though I’ve been getting an education from folks here in terms of flower identification, I’m still pretty ignorant. What I have in mind is a book, probably of 52 images, with one page containing a flower mandala and the opposite page a quotation that complements the image. What I imagine is a collection of quotations, some of which relate to the flowers and their importance in literature, culture, art, and so on, while other quotations are simply thoughts or feelings the images evoke. I’m figuring that people who enjoy and understand flowers as well as the folks at this site would be of great help with either sort of quote. I will include, in the book’s foreword, how I came to the quotes I eventually end up using. I personally would appreciate if you were able to take the time and comment on some of David’s work. My advice is to set aside an hour or so some quiet weekend morning, with a hot beverage nearby. Commenting is easy. On the Flower Mandalas Project forum, it’s as simple as browsing through the threads and posting a reply – you don’t have to register for the forums to post a reply, but we do moderate unregistered replies (so it might take a few hours to appear). Please note that there are four pages of threads – you can access the older ones by clicking on the page numbers in the upper right above the thread listings. For the Phototransformations, click on Comments with the associated image, and post anonymously if need be. Despite being on the Internet for ten years now, I still find it amazing that a relationship between an artist from Massachusetts and a small garden in Vancouver developed a few years ago because we opened ourselves up to conversation, and that the conversation continues to this day as you add your thoughts from wherever in the world you may be. Very Cluetrain. Having just been to the weblog, I am awed. This man may not know plant names, but he has an up-close and personal relationship with beauty. Thanks so much for sharing this. The second photo reminds me a vivid star in the dark sky of our contemporary life! I admire David’s talent and visit forums, concerning his works, with pleasure. These mandalas are a bridge between the mundane and the sacred, between the bloom and its spirit. I am profoundly grateful for this glimpse into David’s vision of something so holy and powerful as a simple flower. TOTALLY COOL MAN!! U HAVE CHEERED UP MY DREARY OLD LIFE!! I have always loved mandalas but sometimes I have trouble relating to them. These are just what I was looking for. Thanks for your vision and artistry. I just opened this and find the site wonderfull. Could you give me more details of this project. Thank-you.